“Moses Receiving the Tablets of the Law”, 1615, plate 33 from the series of 52 plates after Raphael’s Loggia Paintings (titled by the British Museum as “Raphael Bible, after Raphael”). 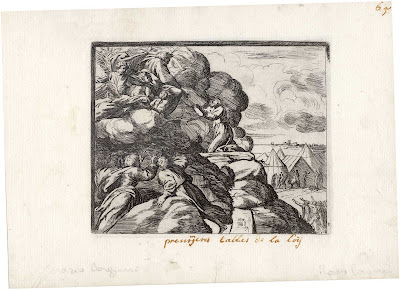 Etching on fine laid paper with large margins and offset print (verso) of “God Tells Abraham His Destiny” (see TIB, vol. 38, p. 374). 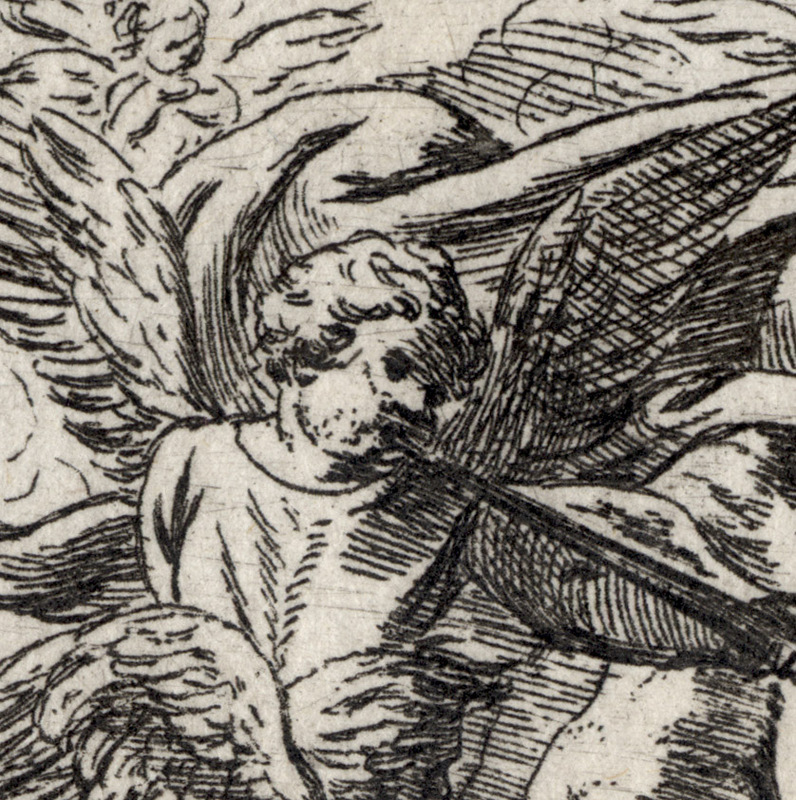 Date “1615” and monogram bottom right, numbered lower right "33". Condition: well-inked impression showing small areas of wear to the plate. The sheet has uneven but generous margins. 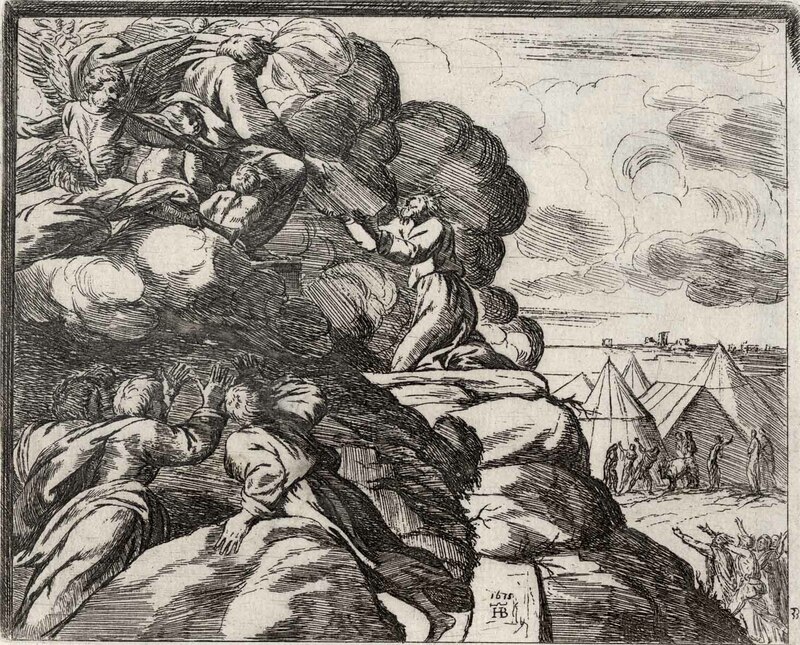 There are a few stains (mainly verso), pencil and ink inscriptions in the margins (recto) and an imprint of Borgianni’s etching, “Moses Receiving the Tablets of the Law” (verso); otherwise the sheet is in a good condition (i.e. there are no tears, holes, folds, abrasions or foxing). I am selling this bold etching based on the design of the legendary Raphael (1483–1520) who had passed away only 95 years before this print was created, for AU$257 (currently US$195.49/EUR183.01/GBP155.90 at the time of this listing) including postage and handling to anywhere in the world. If you are interested in purchasing this rare Renaissance period print, please contact me (oz_jim@printsandprinciples.com) and I will send you a PayPal invoice to make the payment easy. 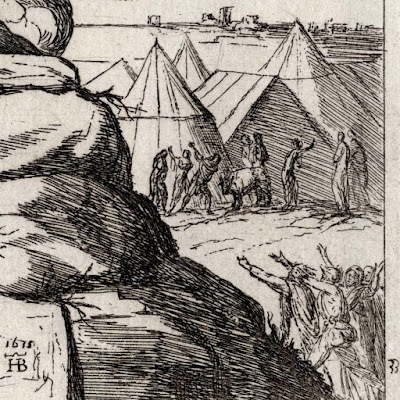 In previous posts I have discussed Borgianni’s feat of completing nearly all his prints in the final year of his life and I have also touched upon his curious (at least to my eyes) use of a shadow rimmed edge to pictorially frame his images. 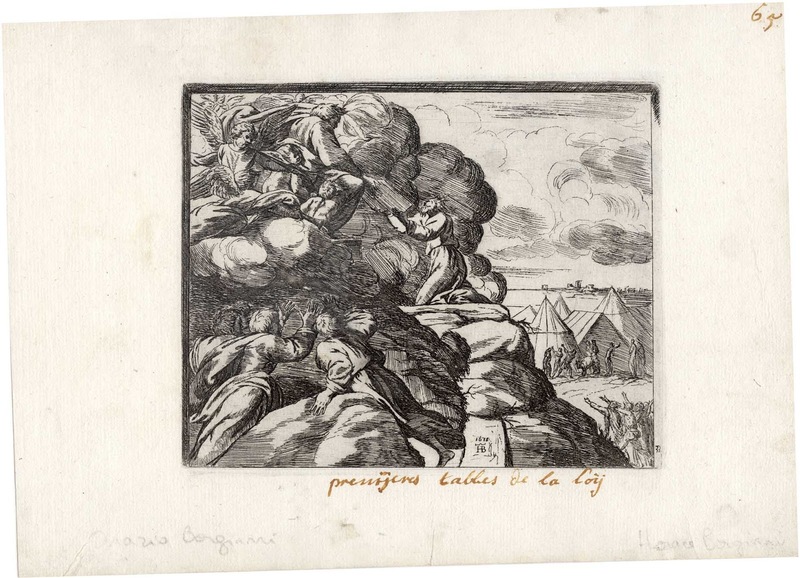 As usual, in this print Borgianni once again uses the device of matching the lighting on the frame with the angle of light falling in the scene: a light from the top-front-left. The lighting angle shown here is very important as it facilitates a Western direction of reading an image (i.e. from left-to-right as opposed to the Arabic or Hebrew direction from right-to-left or the traditional vertical direction of the Orient). One result of employing this conventional top-front-left lighting direction is that viewers have become acculturated to seeing God and his emanating light on the left side of illustrations and so this image “seems right” to Western eyes. 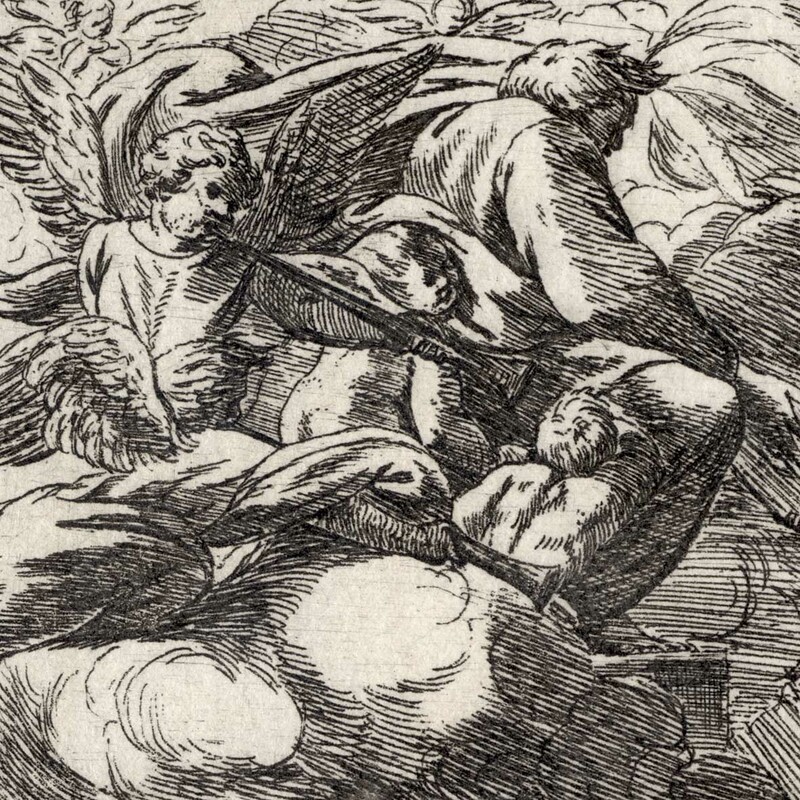 Beyond the angle of lighting, there is an interesting print of another of Borgianni’s etchings (viz. “God Tells Abraham His Destiny”; see TIB, vol. 38, p. 374) that has laid itself on the back of the sheet. At first I simply assumed that Borgianni (or his printers) must have been working in a frenzy and had recklessly laid this printed sheet on top of a freshly printed wet sheet to create a faint offset print. I was almost convinced about this hallmark of poor printing practice as the recto print is not even “square” with the sheet that it is printed on. 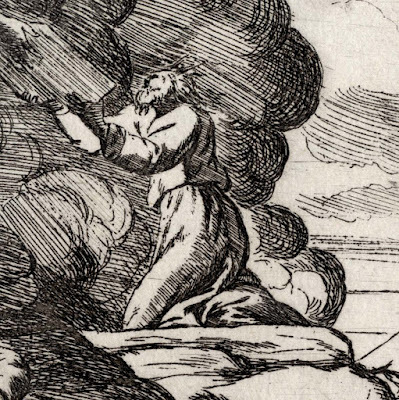 After researching the imprinted image (“God Tells Abraham His Destiny”), however, I discovered that the imprint was not what is termed a “counterproof” at all. It is the “right” way around. 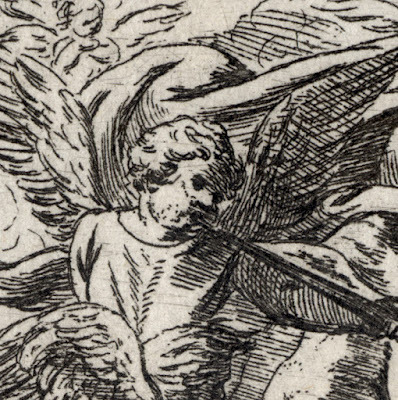 There is only one explanation that I can think of for this curious ghost of a print to be on the back of the sheet: this is an intaglio print taken from the etching plate when there was virtually no ink on the plate. 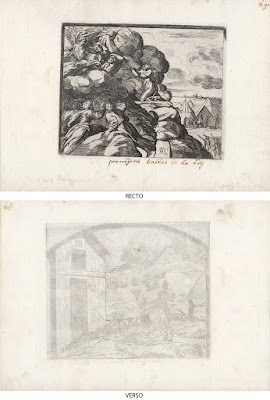 In short, this sheet of paper has two intaglio prints taken from two etching plates rather than a single intaglio print with a offset/counterproof on the back.